A friend and I got together to do a little cooking the other afternoon, and we knocked off a few recipes and divided the spoils. 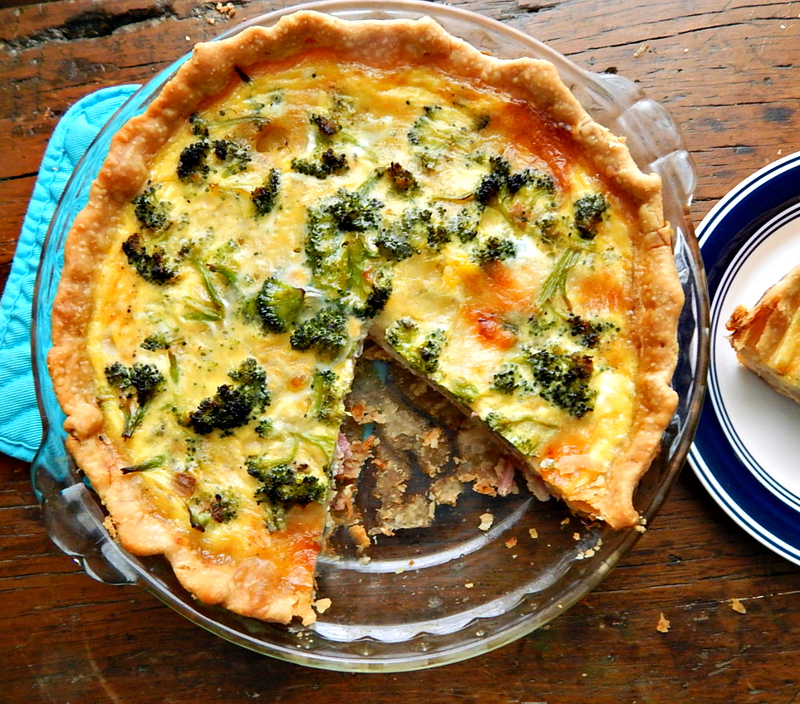 This Easy Broccoli, Ham and Cheddar Quiche was one of them. As she left, she said, “Next time we get together we’ll have to do something fun.” Like this wasn’t, lol? Good company, prepared food in the fridge and a great dinner. You can hardly beat that in my book. Admittedly, my expectations of a fun time might be lower than most people’s! But back to the Quiche. We adapted this from a recipe on AllRecipes, Easy Broccoli Quiche. This is a bit on the lighter side and chock full of broccoli, ham, and cheese. Of course, right off the bat, we knew we were adding ham but we made a few other changes, too. We used deep dish pie pans, which was a good thing, because there’s no way everything would have fit in a standard. We prebaked the shell and used a lot of cheese (which was finely diced rather than grated – try it, it’s amazing!) and whole milk and baked it considerably longer than the original recipe stated. It was only later that I went back and read the reviews on AllRecipe; it was a good thing we took this in the direction we did. Our Quiche turned out beautifully, while others seemed to have issues with the original recipe. The main complaint: issues with the quiche not setting up properly. To avoid that, use fresh broccoli instead of frozen, and cook it well enough (a little past crisp/tender) so there won’t be any weeping. Since this quiche uses milk with no heavier dairy, make sure to use whole milk, and do use lots of cheese. Starting the Quiche at 450 and turning the oven down to 350 and baking long enough is also key. 1 to 1 1/2 cups (4 to 6 ounces) cheese, preferably finely chopped rather than grated, Swiss or a combo of Swiss & white Cheddar. Prick bottom and sides of pie crust, place in oven and bake about 10 minutes or until bottom looks dry and crust is beginning to pick up a little color. Remove and set aside, leaving oven on at 450 degrees. Fit pie crust with aluminum foil and add pie weights or beans. Place in oven and cook for about 10 minutes until the edges of the crust have started to pick up a little color. Remove from oven, remove foil & weights and place crust back in oven for another few minutes until the bottom looks dry. Remove and set aside, leaving oven on at 450 degrees. Preheat oil in a pan, add onion and broccoli and saute for two or three minutes. Add about 3 tablespoons water, add lid and cook until broccoli is done, just a bit past the tender/crisp stage, stirring once or twice. If there is any remaining water, drain. Add cheese first, then the ham to the pie shell, top with the broccoli/onion mixture (just pile the broccoli up and adjust it after adding the filling) and fill with the quiche mixture, below. In a medium-sized bowl, add eggs, whisk, then add the milk. Whisk together and add salt and pepper. Pour liquid into the crust with the cheese, ham & broccoli mixture. Place in oven. Turn heat down to 350 degrees and continue to bake until the quiche is golden and slightly browned in spots and when shaken, jiggles just a little bit in the very center of the quiche, 50 minutes to an hour or so. Remove quiche from oven. Quiche will continue to bake just a bit as it sits and will firm up as it cools. Cool, preferably on a rack on the counter. If refrigerating warm quiche, cover loosely until cold (to prevent condensation) and then cover tightly. leftover broccoli works well in this recipe and saves a step. This entry was posted in Click here for Bargain Meals, Click here for Fabulous Food Posts and tagged Breakfast or Brunch Dish, Broccoli, cheddar, Cheese, Eggs, Ham, leftover broccoli, leftover ham, milk, Pie, Pie Crust, quiche, swiss cheese, white cheddar. Bookmark the permalink. Thanks Chef! I’m missing it already now that it’s gone! Quiches rock! I have to make this for my husband. Looks delicious Mollie! I have yet to meet a quiche I didn’t like, and this one looks both simple and delicious. Something fun to do is to add shredded or crumbled cheese into the quiche pastry dough and bake it, so that you have cheesy dough quiche. Because you can never have too much cheese. Lovely post! Cheese in the crust is a great idea! I’ll try it next time. I’ve added spices in some pie crust and crushed hazelnuts or almonds in others, but never cheese! This is a very good quiche. I’m a little partial to the cook’s illustrated quiche, too, which has cream in it! Hazelnut in the crust is a new thing! I love that idea I’m going to definitely have to try it. This is great. I think even kids would eat this! Especially if the broccoli is finely chopped! Thanks, Mimi! That just made me think how lucky kids are today to have access to so many different foods. I never heard of Quiche until the 80’s!! Hahahaha! They’re all so much more aware of everything! Isn’t that true! This generation is going to “think” so much differently than we do! Hi Mollie– I agree an afternoon in the kitchen with a cooking buddy IS fun! I have a young friend from church coming over next week to bake–talking, mixing, eating is the best. And you are right, there is a lot of cheese in this quiche! It sounds heavenly!! nice to have the fridge full! hugs hugs! Have fun! I’ll look forward to see what you guys turn out! Love quiche and make it regularly. This looks delicious! I don’t know why I’ve been on such a frittata kick lately and just ignoring Quiche…trying to be healthier, I guess. But now I’m looking forward t the next one!! MMM I AM SO GONNA TRY THIS!!!!!!!!!!!!!!!!!!!!!!!!!!! Oooo my favorite type of quiche. Hot or cold, it’s so comforting. I haven’t made them in a while, so thanks for the jolt 🙂 I’ll be sure to make one very soon. I love the combination of flavours in this quiche … my favourite in fact. That was my friend’s idea – honestly, I would have gone for bacon, but I really loved this and was so glad she suggested it. Thank you. It was very tasty! It’s now one of my favorite ways to eat broccoli, lol!! Ooooh, Shrimp?! I’ve never had shrimp in a Quiche but I bet it’s fantastic!! For part of the time in Colorado I lived at 9097 feet and it made such a difference in cooking. Great recipe, I adore quiche and it is equally good cold as leftovers. Thanks, Liz. I think I might even like most quiches better cold. Don’t ask me why. 🙂 This isn’t quite as “custardy” as my fave Cook’s Illustrated, but it was so good!